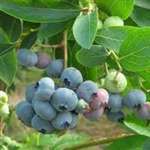 Darrow gives a high yield of very large, dark blue berries with a good, aromatic flavour that are well suited for cooking, but also good for eating fresh. The plant has a vigorous, stocky, slightly spreading habit and will eventually grow to about 1.8m in the open ground. Darrow is a late ripening variety, so expect to be picking the fruit in the second half of August and into September. Introduced in 1965. Very large fruit. Late ripening. Tangy flavour. A good variety for cooking. Two healthy looking plants arrived in perfect condition. Attractive autumnal foliage. We will definitely be coming back for more, perhaps a different variety for the interest. The Blueberry 'Darrow' arrived in excellent condition and even has fruit on it which is now ripening nicely. I wouldn't hesitate to purchase from Tregane nursery again. The blueberry plant was delivered quickly, and was extremely well-packaged in a suitably-sized box, with the pot tied to the box in three places so that it could not move at all. The whole pot was completely encased in a plastic bag to so that no soil was lost. The plant itself was excellent quality, undamaged, and complete with unripe blueberries! Arrived in a very well protected package and is a very healthy and happy looking plant, really pleased with my purchase of blueberry plants from people who obviously love their plants, thank you. I researched blueberry varieties for highest antioxidant value and other nutritional values. Trehane had nearly all the varieties I wanted. I bought four blueberry plants and they were packaged with such care and attention to detail, I was amazed. Having ordered from several plant nurseries in the UK before, I have never seen such well-packed and well-loved plants. They are also in tip top condition and arrived quickly - am looking forward to my blueberries this autumn. I can't fault Trehane nursery in any way.